Hard to believe it’s been a whole year since this little guy first joined us. Especially when I think back to the teeny tiny fragile little bundle who arrived so early – compared to one-year-old Louis, who seems fatter each time I see him. His teeth are coming through at the moment, so his smile looks a little different every few days. It’s a smile that gets a lot of use. This kid knows how to work a crowd. It was pretty tough trying to squeeze in a birthday cuddle with him today, all his doting grandparents and aunties and uncles did not want to give him up! Anyway, being unemployed I had little money for presents but lots of time on my hands, so I made the birthday cake. 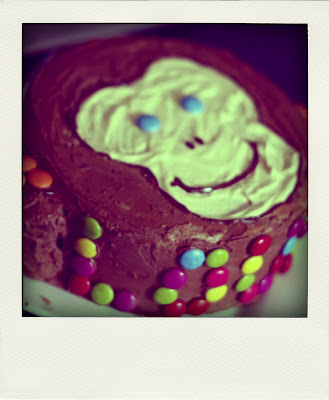 Regular readers will know of my obsession with kids’ birthday cakes of the old Women’s Weekly stable, but believe it or not they’ve never done a monkey (Louis’ spirit animal). Meanwhile I have a whole book of Party Animals, cakes decorated like various adorable wildlife, and there are at least six I am dying to try. Starting with the ice-cream cake echidna, with TeeVee Snack spines and a coat of Ice-Magic. 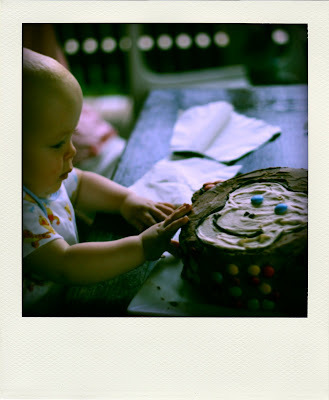 So if you know of any little kids with birthdays coming up, or even big kids, who might be up for some novelty cake action: holla!